In Falcon Lake back in 1970s, there was a little ranch that was up for sale that consisted of twelve horses, a small barn, and a trailer. That little ranch now has 35 horses, seven ponies, sheep, chickens, a gift shop, and three beautiful log rental cabins and is now known as the Falcon Beach Ranch. Murray Imrie had purchased the ranch in 1978 along with a friend. At the time his down payment was a horse and a saddle. Murray, who had grown up in rodeo, definitely had his work cut out for him – Training the horses, fixing up the fences and tack. Eventually he had the ranch in good form. After Murray and his wife, Marg Imrie, bought the co-owner out, their next step was to build a home. 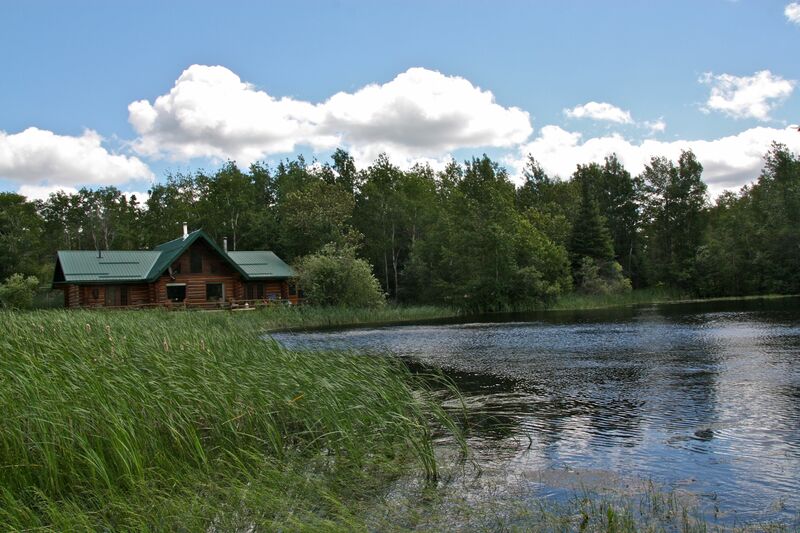 Along with help from neighbours and friends, they began building a log cabin in the spring time and by the fall they had moved in and got married in the log cabin the following spring. They stayed in that log cabin until their youngest, Gillian, was due. It was then that they decided they needed more room and started to work on a beautiful log cabin beside the pond that is now their home. The other log cabin became the ranch gift shop and staff housing. In between building the two log cabins, they had built a large storage shed. Murray and Marg threw a shed party to help replace the items they lost in the fire. The party was a helped toward restoring the equipment they lost in the fire. Murray says that he is even still using some of the old tools. Murray and Marg built their house when their children (Devin, Megan, and Gillian) were little and the ranch began to become more of a year around. 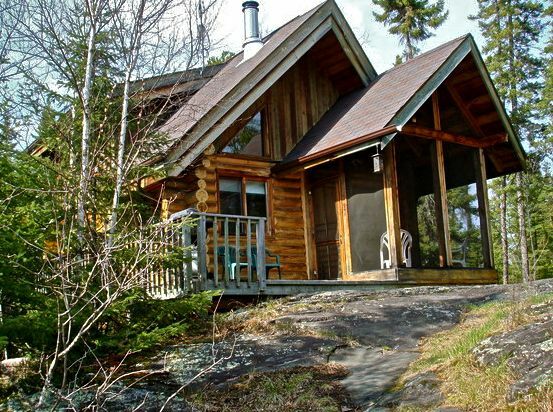 One of the cabins available for rent at the Falcon Beach Ranch. Photo from the Cottager. So in the mid-1990s they built three rental cabins that that are consistent with the quaint and woodsy log-cabin theme of the ranch. Each cabin includes a master bedroom, loft bedroom, kitchen, and screened-in porch. There is also a communal hot tub and sauna area available to all cabin guests. Within the next year the ranch will turn over to their son and oldest child, Devin, and his wife, Kendra. Murray and Marg have purchased a home on Barren Lake and plan to stay around and help out on the ranch. 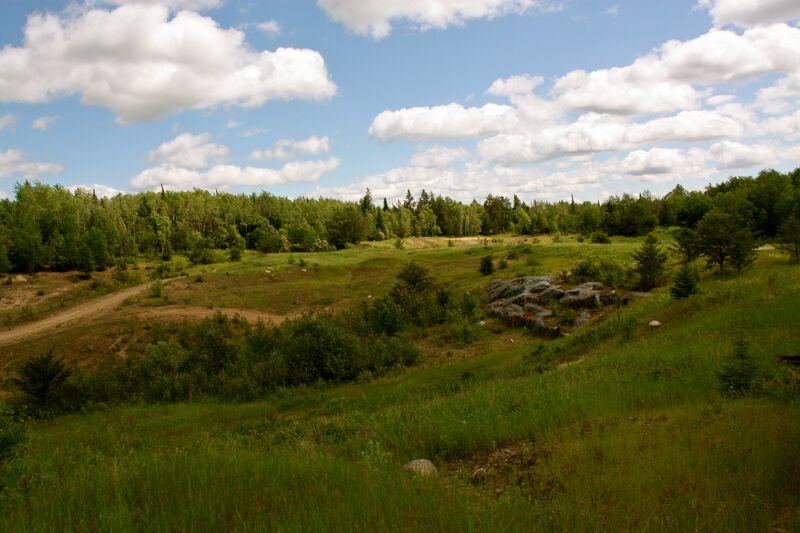 The trails at Falcon Beach Ranch go through a variety of gorgeous forest terrain of the Canadian Shield. Experienced guides review basic horsemanship and safety before each ride. All rides are guided based on riding ability. The ranch books both group rides and private rides. – The Breakfast Ride – Day begins with a home cooked breakfast at the ranch followed by a 1.5 hour trail ride to Barren Lake and back. – The Weiner Roast Ride – 1.5 hour trail ride to Barren Lake and back followed by a campfire and barbeque at the ranch. 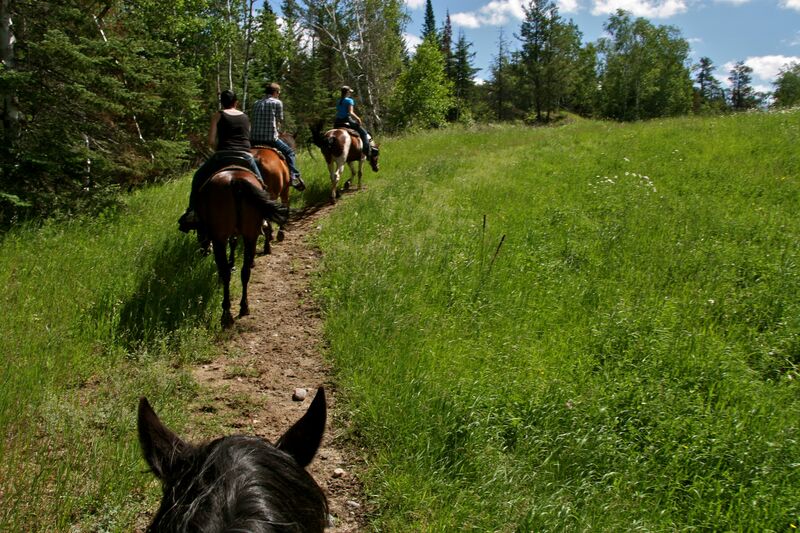 – Overnight Ride – Experience a real wilderness adventure on an overnight trail ride. This ride includes scenic lookouts, rocky trails, and a deep water crossing while en route to the campsite on the shores of Star Lake. Ride includes a full steak dinner at the campsite and breakfast in the morning. 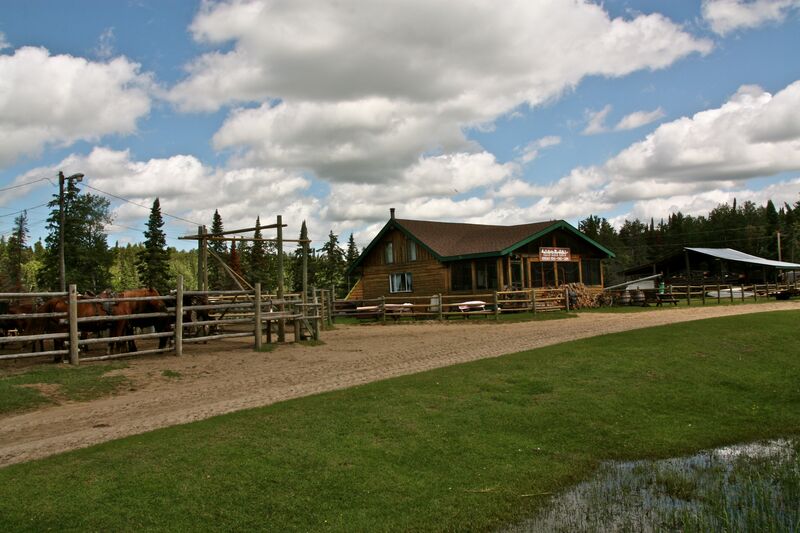 – Steak Barbeque at the Ranch – Scenic one hour trail ride followed by a steak dinner at the ranch. One of the beautiful views from the trail at Falcon Beach Ranch. If you want to get your kid up in the saddle and controlling the reins, the ranch also offers an extensive lesson programs, children’s camps, birthday parties, and more. 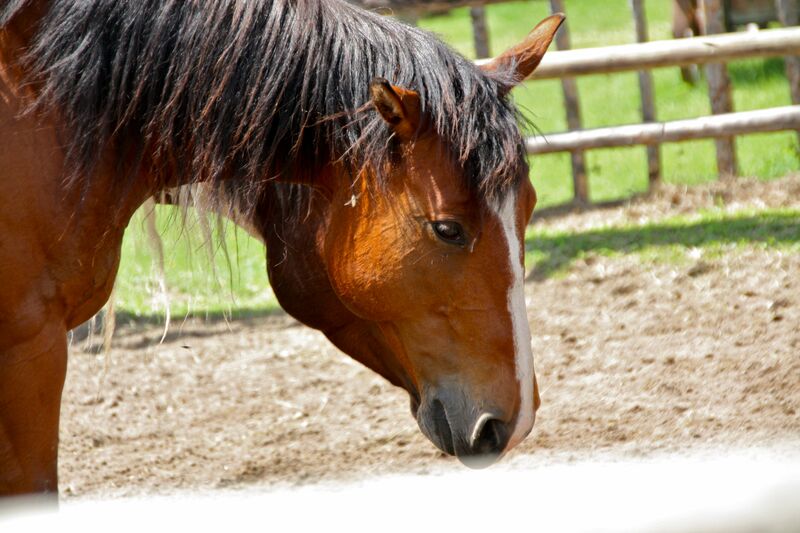 For more information on rides, cabin rentals, and other activities at the ranch, visit falconbeachranch.com. 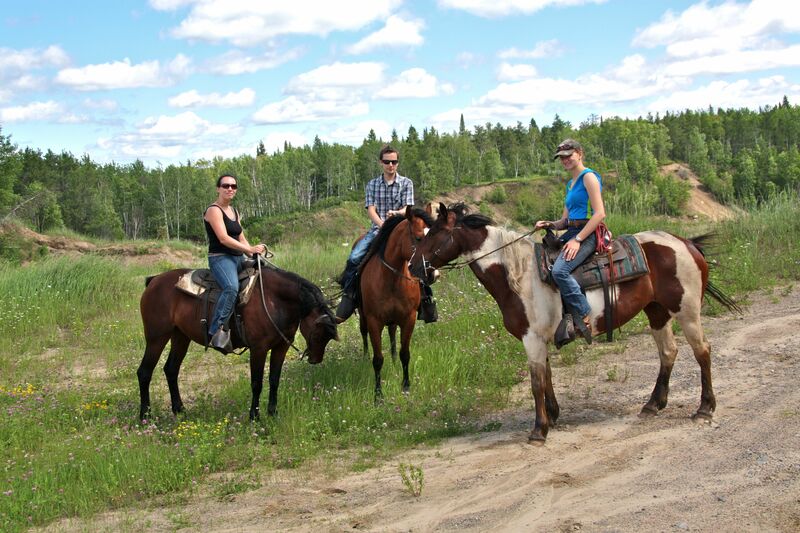 This entry was tagged Barren Lake, Cabins, experience the whiteshell, Falcon Beach Ranch, Falcon Lake, Horseback riding, Horses, Summer, whiteshell provincial park. Bookmark the permalink.